Ever wanted to pilot a mobile suit and really have a unique gaming experience? 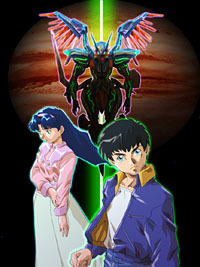 Sure, you might get all that fan excitement from the Gundam games, but don't you want a unique experience where you don't already know the whole story? 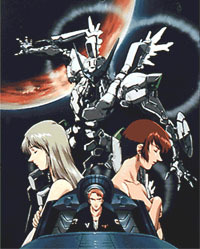 If you answered yes, then look no farther than Konami's must-have Playstation 2 game, Zone of the Enders (or Z.O.E. for short). In a nutshell, Z.O.E. is brought to life by a team of KCE Japan West technical gurus headed by Hideo Kohjima (who's other killer project is Metal Gear Solid 2, but you already knew that didn't you?) Anyway, the game immerses the player in a massive mecha combat experience with a plot that's sure to spawn countless story variations in the fan community. When you first look at pictures of Z.O.E. the first thing that will undoubtedly come to your mind is the nature of the mech designs which seem to look a little familiar. Well, they do look familiar, so don't stress your brain trying to figure out why they look sort of like Gundam designs. That's because all the character and robot designs are the work Gundam X's own Nobuyoshi Nishimura. But, the anime inspiration doesn't stop there. In countless articles on the net and in print form the correlation has been made between Z.O.E. and Neon Genesis Evangelion. The truth is that Z.O.E. did take inspiration from not only Eva but virtually every other mecha anime out there. 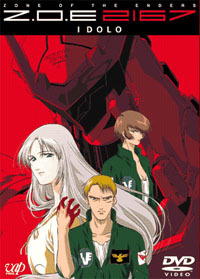 What is left is a conglomerate of the best things from every series combined to give a true experience that makes you feel like you have just taken the helm of a sleek giant robot known as an 'Orbital Frame' in order to defend your space colony home from destruction by enemy forces set to take the mech you now pilot. In the heat of battle you must not only learn how to pilot the thing with all you've got, but you've got to make it an extension of yourself in order to not only keep yourself alive, but to protect the people who've hated you for so long. There's only one problem, if you don't maintain self-control and act like a hero instead of a loner, then you'll end up destroying everything in a blaze of fire and shrapnel. 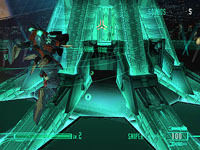 In Z.O.E., as director Noriaki Okura describes it in PS2.IGN's interview: Z.O.E. : In The Director's Seat, "I wanted to come up with a robot anime simulator where you actually become the main character. When you play the game, you'll feel like you're the protagonist in an anime - and they'll have to face dilemmas where you have to save yourself while saving others." It's this unique experience that set's Z.O.E. apart from all the other giant robot games out there. But, don't get us wrong, like any game you can go and use up as much of your ammunition blasting every bit of the highly-detailed scenery in sight. But, to truly experience Z.O.E. you have to think like a hero because you are actually the hero in the game. But to truly understand the Z.O.E. Universe is to be immersed in the thought provoking story which the game only is able to cover a small fraction of the massive time line that has been created for the game. Throughout the 21st Century there where a number of scientific and technological advances after the a space warping ore was discovered on Europe. Together with the ore Helium-3, LEV robots were developed by the NUT Corporation and an easy of development in harsh regions. Faced with overcrowding, mankind branched out into space. But the proprietors who funded the colonizations sought to reap the benefits from their cosmic colonist and where there is oppression, there is hatred. Rebel factions began to crop up in the form of militias and soon were able to get there hands on a proto-type Orbital Frame unit which was developed from the original LEV units. Time passed and the unit found it's way to Europa's Antitlia Colony in a United Nations Space Force junkyard where a troubled 14-year-old boy named Leo Stenbuck finds and boards the mysterious unit known as Jehuty as the Z.O.E. faction from Mars starts their elaborate attempt to hijack the Antilla colony. But can he hardly the pressure of holding the fate of the colony on his shoulders since he has the power to save the colony that has shunned him for so long. But what lead to the events seen in the game? What exactly happened five years ago to set the threads of revolution in motion? The answers can only be found in the OVA movie from Sunrise and VAP appropriately named Z.O.E. 2167 IDOLO. The time is AD2167, Humans had expended their world to planet Mars. However, the humans who moved to Mars in the hope of finding a better life had now grown to dislike those who were left behind on Earth (now being referred to as a "Realm on the Far Edge of Civilization") and began to refer to themselves as the "Martians". And among the Martians living in the region of Vacilia County, lives Radam Levans, a Bahram Militia Group LEV pilot. With a bright military future ahead, pilot Radam and his subordinate Viola Gyune suddenly found themselves on a mission to Nocudes, an outskirt region of the Mars territory. Awaiting Radam in Nocudes is a top secret development project involving the next generation humanoid weapon Orbital Frame Idolo, and his lover Doris who has also been assigned to the project. Doris is also the assistant to Dr. Rachel who is responsible for the development of the Orbital Frame system in Nocudes. 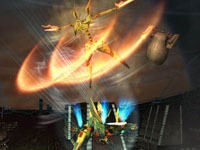 As Radam begins to realize the astonishing mobility and destructive power of the new weapon Idolo, he begins to lose control over himself as he is slowly taken over by the rush of power placed in his hands. The day of public demonstration had finally arrived and in order to obtain top secret information, LEV units sent by the Earth Observation Force finally come face to face with what they had been looking for all along - the prototype humanoid weapon Idolo. And in the mist of battle Radam finally realized what he had done, seeing the destruction he caused, Radam finally decided to withdraw from the military. And in hopes of gathering additional information about Idolo, the Earth Observation Force carried out their plan to kidnap Dr. Rachel, along with Doris, who was caught in the middle during the execution of the plan. After hearing the news about Doris, Radam returns to the base and decides to use Idolo to save Doris even if that will mean violating all the military rules he had been living by all these years. However, little does Radam know, catching up with the Earth Observation Force shuttle at Deimos Station is merely the beginning of the great tragedy that will go down in history as the "Deimos Incident." Rachel is the current head of the Orbital Frame Development Project. But, she is beginning to have doubts about the Idolo unit she has strived to create. Rachel is the only person from her family who lives on Mars, thus her views seem to be torn between those of her former home, Earth, and those of the Mars colonies. Viola is a native born and raised Martian with deep Anti-Earth views. She is currently a military officer for the Martian Rebellion Forces known as Bahram and belongs to the same division as Radam, whom she has a great respect for. She has been assigned to the new weapon development project of the Orbital Frame humanoid weapons in the capacity of a Frame Liner. Bahram's top secret project, a prototype of the next generation LEV unit concept. It is the first creation that was made up mainly of the rare metal "Metatron." Although it is said that it possesses ten times the performance capabilities of the LEV used by the UNSF, the machine handles extremely difficultly. The shape is also very different from old type LEVs. Nobody else seems to be able to control it other than Radam himself, is this because of the use of "Metatron" in the body structure? A space colony that is stationed on Europa L5. Construction began in 2111 A.D., but due to the Deimos Incident the colony is presently under United Nations Space Force occupation. An Anti-Earth group that was secretly founded on Mars in 2158 A.D. that is researching Orbital Frame technology to take their independence from the United Nations by force. The Guard Division Corps of the United States Management District disregards repeated warnings of the United Nations Space Force to cease investigation of the colonies. The results lead to a crisis in 2157 A.D. when territories are violated on Mars. The investigation teams have to be rescued, but a national secret involving the Jovian ores is uncovered. Implemented in 2145 A.D. after a new wave of emigration occurred on Mars, the system involved each member/country of the United Nations administering there own corresponding colony on Mars. In 2167 A.D., Bahram terrorist of an Anti-Earth sect use a stolen experimental Orbital Frame unit to attack officers of the United Nations Space Force (UNSF) at the Space Catapult installation on Mars's satellite, Deimos. The center of humanity and the seat of the majority of the power in the solar system by way of the United Nations. The planet is surrounded by a number of orbiting satellites, bases, and Lagrange points as well as the Orbital Elevator. A generic title used to describe people who live in the frontiers regions of space. The term is derived from the common notion that the people are living on the "ends of the universe." For the people in the Mars and Jupiter sphere regions, this notion has become an ideal that they live by. An energy supply system used in the Antilia colony as a way of powering all private flight bodies uniformly. The energy comes from an antenna set-up at both ends of a colony in the form of the microwave dish. One of Jupiter's moons which is the home of the Antilia Colony. The moon is used as a support base containing over 100,000 laborers for the excavation of Jupiter's resources. The generic name by which people who live in colonies are called. Due to racism from the Earth the colonist have banded together to make the most of their personal slice of their new home. The term used to describe the pilot of an Orbital Frame. Those who control an Orbital Frame unit. One of the two minerals that are mined from the Jovian satellites that lead to many scientific and technological advancements. A mysterious new model of Orbital Frame that has spawned civil unrest in the colonies. The unit has fallen into the possession of a 14-year-old Jovian boy known as Leo Stenbuck. A 20th Century scientist who built a solid framework for quantum mechanics and also worked in game theory and was able to investigate spaces with continuously altering dimensions. He was also a pioneer of computer science who advocated the instillation of the bit as a measurement of computer memory. A term used to describe the territory in which Jupiter and its moons orbit. A manned work robot that was developed to work outside in the vacuum of space so that the space stations and colonies could be completed. The dynamic gravity balancing point which exists between three heavenly bodies (Sun, Earth, and Moon) which mathematician Joseph-Louis Lagrange found in the 18th century. A colony is constructed in each of the three unstable Earth-based Lagrange points that the gravity of the Earth balances due to the centripetal force of the Earth and the rotation of the moon. The remaining two Lagrange Points are stable orbits and can be found between Earth and Jupiter. A system for material transportation which passes along the outside layers of a planet's sphere range. The internal electromagnetic surfacing system is used in conjunction with the Linear Driver as a special container which loads materials that are to be transported. The generic name by which people who are born and raised in the Mars sphere are called. A series of drive units used by space ships for high speed travel. The "Ore" which is enumerated as one of two great elements which become foundation of space development. In 2040 A.D. an unmanned explorer probe came across a plain on Jupiter's satellite Callisto that contained a number of ore veins. It was not until 2081 A.D. that testing of the material collected showed that it had special properties that could be utilized by a number of different research fields. In particular, the substance lead to great advancements in the field of LEV technology and in the field of high-speed space travel due to it's ability to compress space. A kind of quantum computer which uses Metatron for integrated circuit and breaks the line that was drawn when the digital von Neumann type of computers were developed. The new computers use a widely different operation speed due to the circuit miniaturization process utilized. The computer is literally able to increase it's access speed and expand it's memory capability due a circuit distinction between the operation memory and the arithmetic unit. A powerful model of Orbital Frame used for front line combat that utilizes a pilot manning it from a cockpit located inside the unit. The unit's pilot is currently a 22-year-old military pilot named Viola. An Earth based conglomerate that utilized new Metatron-derived substances with the original LEV design structure to create the first Orbital Frame technology. They have been in business since the 21th Century and have become the leading manufacturer of LEV units. They were also the first to develop the controversial Orbital Frame units. Mobile armored suits developed for combat purposes by Anti-Earth parties in order to turn the tides against the UNSF. The suits have both mobility and the attack power to surpass a LEV by using the scarce mineral Metatron. A mass production model of orbital frame. The protective technology used in Orbital Frames that uses Metatron to create an impregnable hardness and at the same time have an elastic give that restores to its original shape through the use of self-generating energy. Though Metatron's ability to distort space allowed space ships to reach faster speeds, it is not practical to install new drive units into space ships due to the power and capacity needed. For these reasons a more efficient method of high speed transport was devised. An orbiting catapult was set up in the Lagrange Point near Deimos in order to send materials to the adjourning catapult port near Europa. An index in which overall war potential differences such as airframe data, pilot attainments, situations, etc. are simulated. A large orbital frame utilized in wide-scale demolition. The term used to describe the unique "downloading" process on a Metatron computer. Unlike the von Neumann-type of computers that were the previous standard, when a file is copied from one destination and placed in another the original file is not deleted. Due to properties of the circuits used, the circuits physically reshape themselves to conform to the new networking that occurred due to the movement of the file. The independent nation formed by 16 Martian counties that have organized into one solid political union that is lobbying for increased Martian independence. Earth's military force that keeps the peace in the space colonies. Martian colony filled with Anti-Earth supporters who are the creators of the Orbital Frame technology. A distortion effect created by the use of Metatron as it creates energy. The effect is utilized in colony facilities, large-scale freighters, and various other large pieces of equipment as a means of storing large quantities of material. The vector trap is also used as an ammunition hangar in the Orbital Frame known as Jehuty. Mock training which uses virtual space.